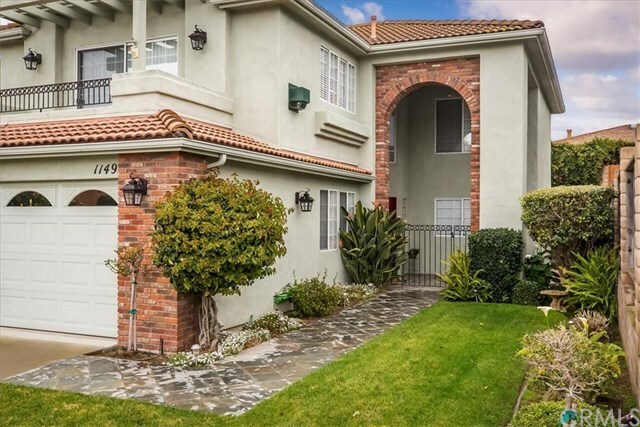 This light and airy, move-in ready, 1754 sqft S&S built Costa Bella home offers 3 bedrooms, 2.5 baths, and boasts an open floor plan with living areas upstairs to take advantage of the gorgeous views of hillsides, sunsets, and city lights. Lush landscaping invite you to the gated courtyard entry. Vaulted ceilings, skylights, and lots of windows enhance the feeling of spaciousness. The living room features a view deck and a granite faced fireplace. The kitchen was recently remodeled with newer appliances, granite counters and updated lighting with a large pantry and is open to the dining and living areas. The large master suite includes a Juliet balcony, a walk in closet, and an en suite bath with double vanities, a soaking tub, and separate shower. The tranquil, low maintenance back yard with patio and flagstone feels like a private retreat. There is an oversize double garage.. Great location on a quiet cul-de-sac, close to the beach and shopping. This one is a gem.